Here are some goodies that you can print out on standard 8.5″ x 11″ letter paper. Click to enlarge, save to your computer, and print as-is (do not re-size). Cut out and insert into DVD case or affix to a comic book cover. 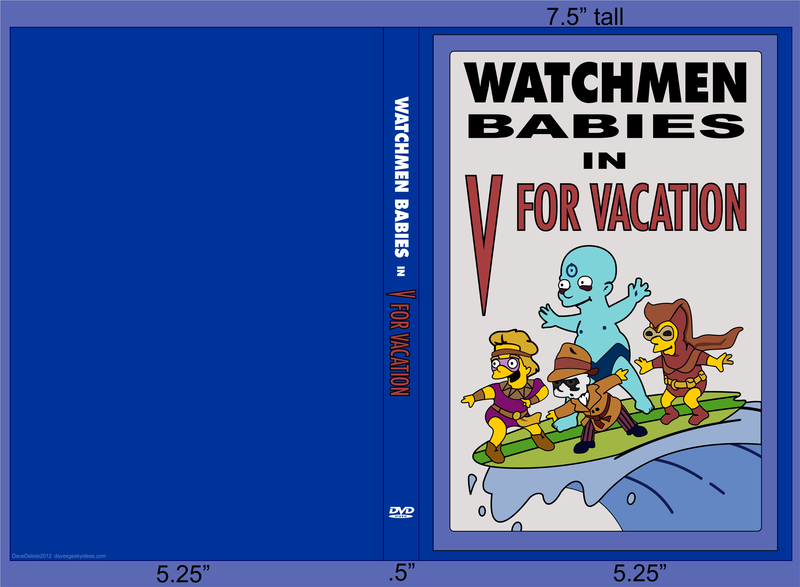 Above is the DVD Cover for Watchmen Babies In V For Vacation. It’s for the standard amaray case, but many DVD cases do vary in size. Apologies in advance if you have to undergo some trial-and-error and need to re-size. Didn’t bother with back art (didn’t know what to put there). If you want an authentic look, paint the spine blue to match what Milhouse was holding in the show. Whatever you do, please DO NOT ask Alan Moore to sign this DVD case. You are jeopardizing yourself and more importantly me. This is a comic book cover. 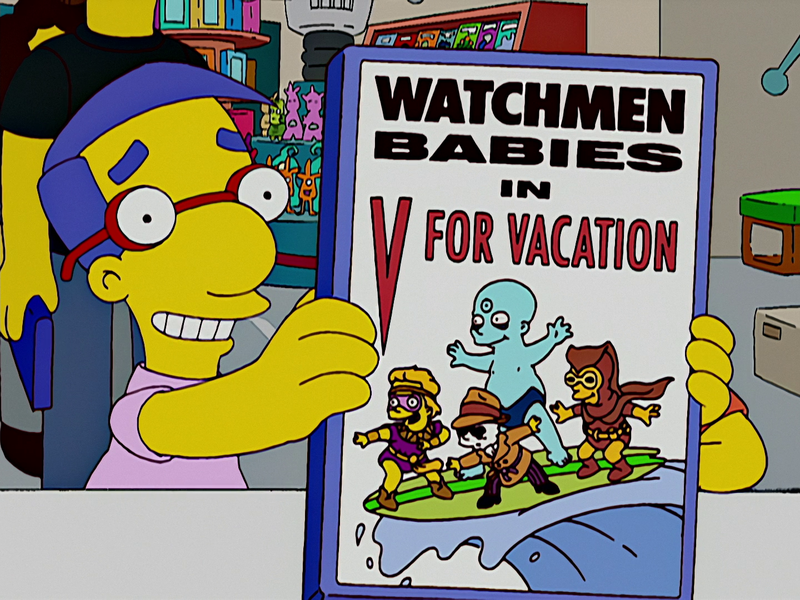 Affix it to a comic book for a fake Watchmen Babies issue (you’ll need to sacrifice a comic book). Or you could just let is sit in an insert with a book. This is a PNG file, so you could enlarge it for a poster or use as a desktop wallpaper. Other printable stuff: X-Men Diploma, Good Will Hunting Painting, and some Mouse Rat merch. Note: Yes this blogger is back after a whopping 17-day retirement. There are several reasons for this, but mostly due to the overwhelming show of support that came in the form of emails, comments, and tweets. The recent closures of Rockstar Vancouver and Radical Entertainment (the latter being where I recently worked) also provided a lot of perspective – I really didn’t have it that bad. The Hockey blog will resume in the fall. It’s too scorching to think hockey here in Vancouver. I didn’t delete the “I QUIT!” posts, merely set them to private. Thanks again to everyone, I hope you enjoy whatever craziness I post for the foreseeable future. Ya know I think the ladies would dig that. Hockey can take a breather for now. Such a short offseason! Nice to see you’re here. No pressures. BTW, I’ve decided that I need to get back to blogging myself, and not hang out on FB or G+ as much (yea, right!). Glad you’re back! Deeply enamored of both of your blogs. Now should I put this on my Watchmen DVD, or my V for Vendetta one? Both great movies! Can’t you sacrifice another film — TRON Legacy or something?